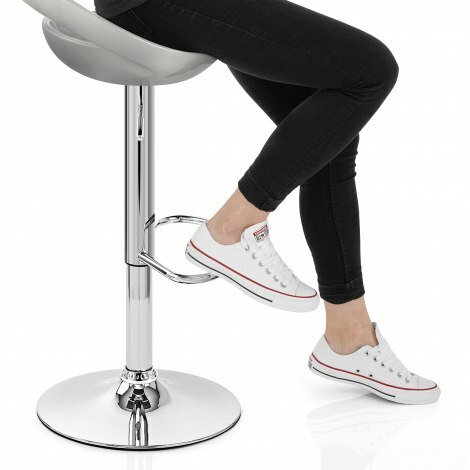 With a design that uses the best of both contemporary and 60s styling, the Crescent Bar Stool Silver is a brilliant piece of furniture, ideal for a bar. Retro chic and modern efficiency work seamlessly, making the Crescent a beautifully proportioned stool that will never disappoint. The seat is ergonomically shaped for superb comfort and is moulded from hardwearing ABS resin finished in a high gloss silver. The backrest arches across the seat for added support and to provide a little extra visual impact. The seat perches on a chromed stem which houses a variable height gas lift and 360 degree rotating mechanism, giving the Crescent added dynamics. Also, on the stem is the handcrafted footrest, fashioned from chrome-plated steel. A strong circular base has a rubber ring beneath to protect your floor, which ties up the whole package perfectly. "Quality item & at the cheapest price"
PERFECT and reasonably priced - Thank you. I was really pleased with the comfort, price, style and sturdy quality after searching for a while for exactly what I wanted. Ordered late afternoon and arrived 8.30 am next day.. already had 3 of the stools - great for exhibitions. Great product, great price and super fast despatch. Ordered Sunday morning - received Monday morning at 8 am. Would recommend Atlantic shopping.